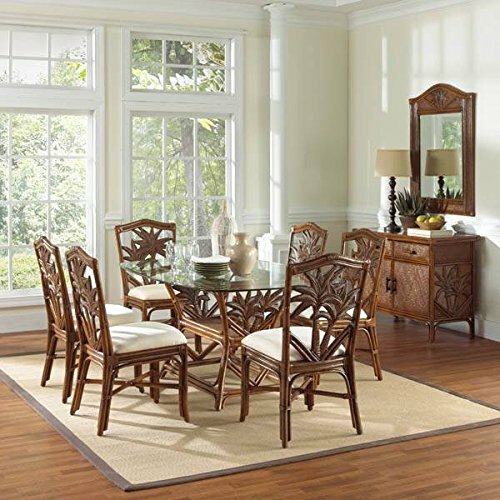 The seven-piece Cancun Palm dining set sets a tone for relaxed family meals and entertaining. Six side chairs feature cane framing with frond-themed back insets. A matching glass top rectangular table incorporates a center woven display shelf. Includes: 1 Table - 6 Side chairs. Made of Rattan Poles & Woven Wicker. Sideboard and Mirror not included. Finished in TC Antique Color. Fully assembled. Constructed of commercial quality rattan poles. Herringbone wicker weave. Glass top is a 42 in. x 62 in. Surfboard with beveled edge. Side chair: 20 in. W x 23 in. L x 38 in. H (13 lbs.). Table: 62 in. W x 22 in. L x 30 in. H (87 lbs.). This Cancun Palm dining collection is one of our exclusive and largest collections of fine rattan and herringbone wicker weaving. That has a fiber palm tree castings design. The woven leather bindings used throughout Cancun Palm ensures its durability and quality for many years of use. It enhances the tropical look in any dining room. The selection of two finishes help compliment any room decor. If you have any questions about this product by Hospitality Rattan, contact us by completing and submitting the form below. If you are looking for a specif part number, please include it with your message.